Heat oven to 350°F. On ungreased cookie sheet, drop dough by rounded teaspoonfuls 2 inches apart. Bake 10 to 14 minutes or until golden brown. Cool 1 minute; remove from cookie sheet to cooling rack. Cool completely. In medium bowl, mix whipped topping, marshmallows and chips. Spread mixture about 1/2 inch thick on bottom side of 1 cookie. Place another cookie bottom side down on filling, pressing down lightly. Repeat with remaining cookies and filling. Place on large cookie sheet. Freeze until firm, about 4 hours. Wrap individually in foil or plastic wrap. Store in freezer. 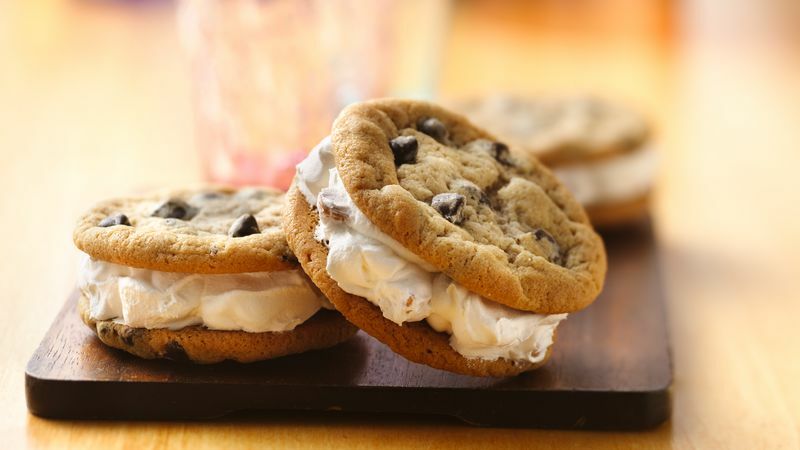 Substitute your favorite cookie dough flavor for the chocolate chip cookies.